Meet genre-spanning writer, director, producer, philosopher and sleep Caryn K. Hayes is telling a wide array of stories about the LGBT community with her films and web series. We sat down with this creative zeitgeist to find out how she does it all. How did you get started in film making? Have you always been an artist? How has your life informed your art? I started writing fiction when I was 11. My second semester in college was when I fell in love with producing and working behind the camera. I wouldn’t say that my personal life has informed my work very much as I can see storytelling as a way to escape into new worlds with unique characters, the same way I did when I fell in love with reading as a child. Writing is generally exploration of the “what if” for me. There’s this idea in Christianity that a couple must be evenly yoked, if their marriage is to be successful. And while I haven’t dated anyone who doesn’t share my beliefs, it occurred to me that I might be in that position someday. That was the “what if” at the core of “Clean Hands.” It just grew from there and became about so much more than just a story about spirituality and relationships. Yes, they are pretty different. LOL. I figure if I’m going to be the one in control and shaping the beginnings of my career, I want to flex a different muscle every time. As for “Entangled,” it follows a stoic lesbian, a perky straight woman and their dysfunctional romantic relationships. At the start, Jaliyah is looking for a new place to live and when she declines her girlfriend’s invitation to move in together, Rocky takes off on a year-long tour. Meanwhile, Alisha is content in her relationship until her boyfriend Craig gives her gonorrhea. Alisha kicks him out and Jaliyah moves in. The two new roomies get off on an awkward, having nothing in common besides a mutual loneliness. That is until both Rocky and Craig grow suspicious of what could develop between them. You seem to be working on a lot of projects all at once. How do you balance all your projects? Do you sleep? I do sleep! I can’t function without sleep for any sustained period. I’ve forgone having a life though. LOL. Since I started producing my own work, I’ve made a lot of sacrifices to accomplish what I have, which includes a lot of sleep, relationships, vacations and even new furniture and clothes. Finding a balance is hard, but since hitting 30, I have been working hard to pull back some. * small voice * It’s not working very well. What’s the one thing you can’t live without when you’re working? Depends on the work, whether I’m writing or something else. When writing, food and music. In your free time, if you have any, what do you do for fun? What is this free time of which you speak? I love karaoke, but I pretty much only do it for my birthday when I can drag people out. I like physical activities, like skating, martial arts, other sports, laser tag. I love playing Taboo or spades with friends. What’s next for you? Do you have a dream project that you’d love to make? Who would you like to work with that you haven’t already? I’m working on a new web series called “Wing Woman” that we’re shooting later this month. I have a TV pilot I’m shopping that I would love to either sell to a network or produce myself; I don’t have the money for that because it’s pretty slick. I want to do a feature soon, hopefully next year. I would love to work with Angela Basset, hands down! If I could get Meryl Streep and Angela Basset in the same project, I think I’d retire immediately after because that would clearly be the peak of my career. 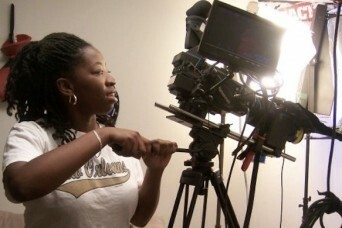 Learn more about the hardworking Caryn K. Hayes at her web site, HardlyWorkingEnt.com. Posted October 9th, 2014 & filed under Interviews.